Finished painting the motor, just popped it back in. Almost there. 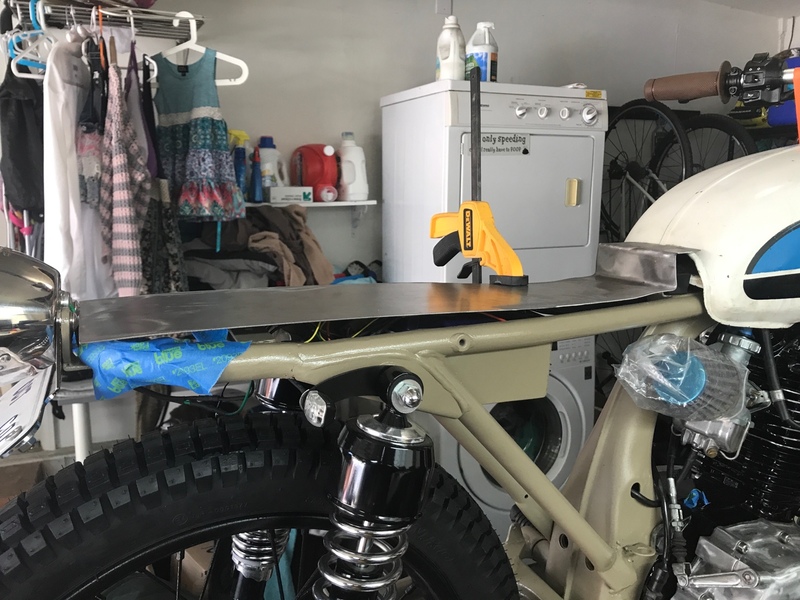 Worked on the seat pan this past weekend. Bought material to try and attempt to make my own seat and cover as well. Plugged in my power last night and everything worked! Well almost everything, need to check the wires on my tail light. Does anyone know what is going on in the video below? Finally got the bike running but ran into two issues and in the below video being one of them. It seems like either oil or gas is coming out of the lower cylinder. I have been told its a blown head gasket, but its just a guess. Has anyone run into this before? You've blown the base gasket, which is quite unusual on a four stroke. 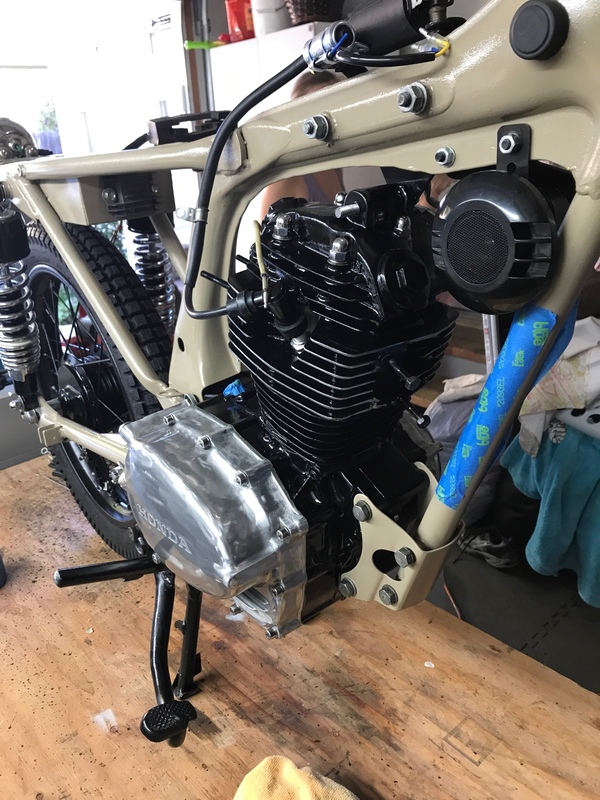 The first thing you should check Is the crankcase breather to make sure it's not blocked. Did you rebuild the engine? Not a full rebuild, but I had a thicker breather tube on the crankcase breaker. Maybe it wasn't getting enough air? If your breather is clear then check the oil level and make sure it's not too high. 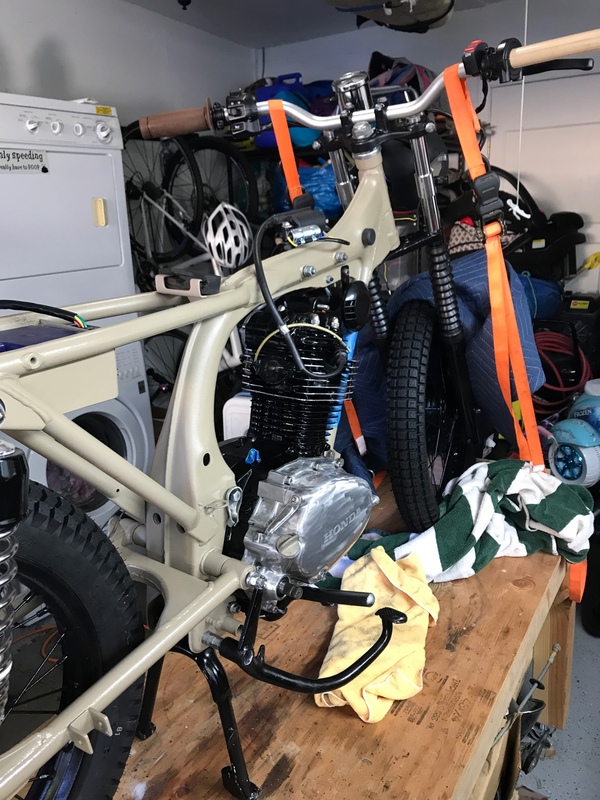 If it is high and it wasn't before you started then it may be a mixture of fuel and oil which can be a result of the carb flooding and filling the cylinder with fuel if the inlet valve happens to be open at the time (this all happens while the bike is stopped). If the oil level is OK then it's likely the piston rings not doing their job. Thats good to know. Unfortunately, i already drained the oil to start the process to pull the motor out and apart to check the cylinder. I guess I will check this first and go from there. thanks for the help. 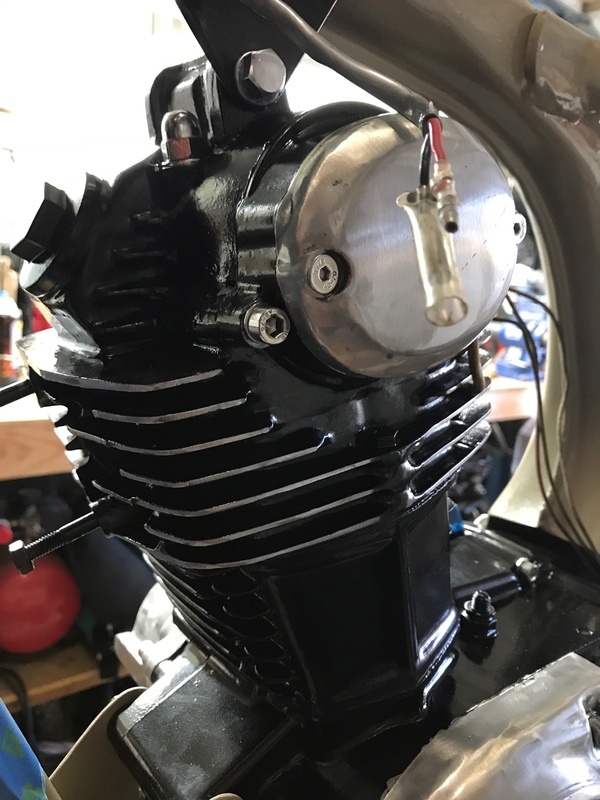 I rebuilt the top end due to a crack in the bottom cylinder which I replaced. I have the bike running now, I cant seem to get the bike run and idle properly though. I have rebuilt the carb and cleaned it a few times now and even bought carb rebuild kit. I got it to a point this past weekend where it would run with out the choke out which took a bit of tweaking with the carb. I have ridden it down the street and it sounds like its choking and not getting enough fuel. There is fuel in the line, I have adjusted the throttle pin to run more rich. 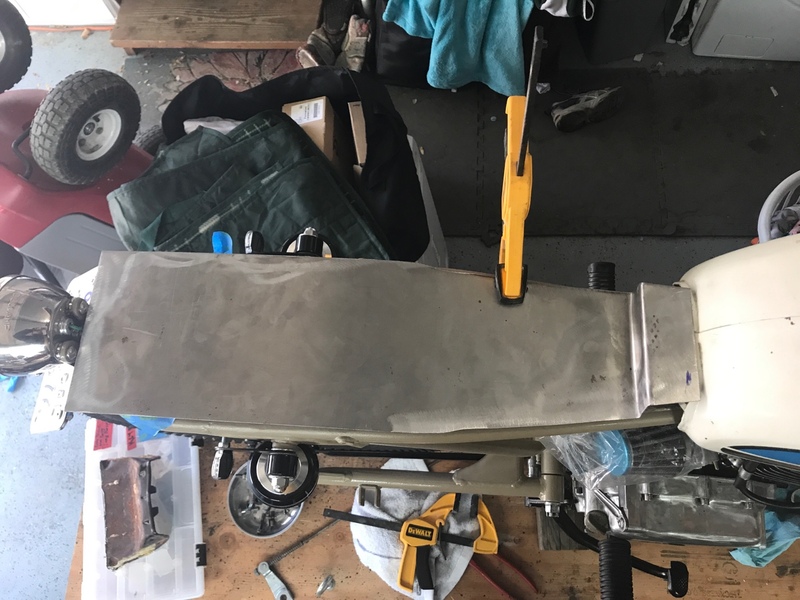 I order a few different size main jets to test, but I am running out of knowledge, skill and ideas. 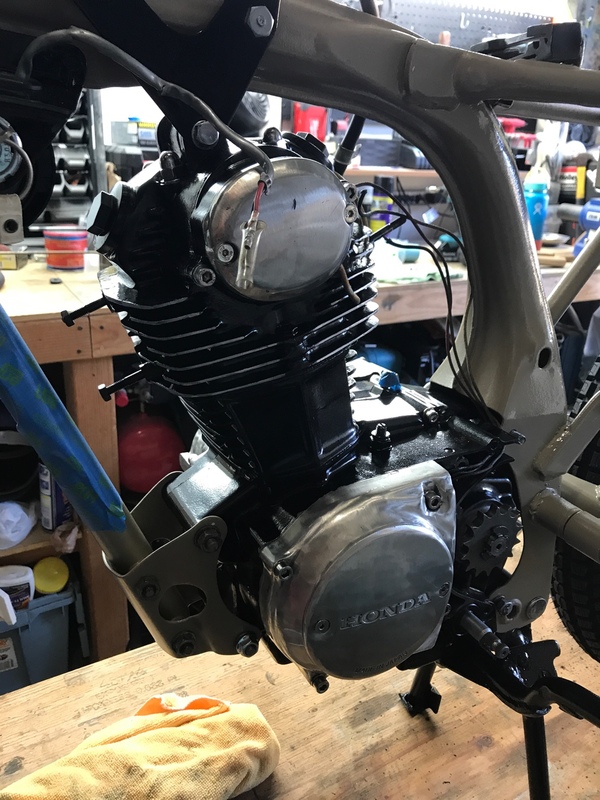 You need to get more intake length between the carb and the filter, the lowly CB100 does not respond well to intake and exhaust changes. If you can find a silicone elbow or something like that you may have an easier time tuning, otherwise I think you'll be chasing your tail.